Unlike some of the other magazines we look at here, The Youths Companion is actually covered very well on a few other sites. I’ll reference a couple of those in this article, which will take a look at the basic history of The Youth’s Companion, take a quick look inside a typical turn of the century issue, and cover some high spots for collectors. While The Youth’s Companion peaked in popularity under the ownership of Daniel Sharp Ford, who purchased the publication in 1857 and owned it until his death in 1899, it actually dates back further than that. The Youths Companion was founded in Boston in 1827 by Nathaniel Willis and his partner Asa Rand. By most accounts the Companion was a terribly boring and dry magazine filled with religious articles and moral instruction. It was important because there were few magazines targeted at children available at this time. The Youths Companion under Willis may have filled that void, but circulation was largely regional and only reached 7,000 by 1857 when 78 year old Willis sold the publication to Daniel Ford and J.W. Olmstead, with whom Ford soon split. The major motive behind that split was Ford’s idea for expanding the subscription base: premium offerings. 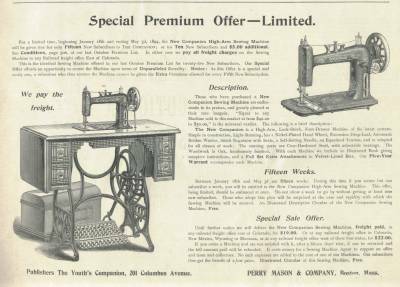 This premium craze began in the late 1860’s and as images on this page attest ran through to at least the mid-1890’s. In essence The Youth’s Companion would distribute prizes ranging from stationery, hair brushes, watches, sewing machines (see below), magic lanterns, all the way up to a piano, based upon the amount of new subscriptions you could procure. The gimmick worked, responsible to some degree for The Youths Companion explosion in circulation, up to 400,000 subscribers in 1887 and over half a million by 1897. But also behind this incredible growth under Ford was a change in the editorial matter inside The Youths Companion. Ford was bright enough to see that an audience limited to children only gave The Youths Companion only so many years in the life of a subscriber. The magazine expanded its offerings to include the entire family, and by doing so expanded its own lifetime to the lifetime of the subscriber. According to Tebbel, the typical issue would include “outdoor adventure stories, historical articles, anecdotes, contests, travel articles, and editorials” (158). A stack of over a hundred issues from the 1890’s that sits behind me as I write this confirms Tebbel’s summary of contents. “The Children’s Page” was there for the youth in its title, but by 1897 The Youths Companion also touted itself as “An Illustrated Family Paper,” which throughout that decade and into the new century would publish work from notables such as Grover Cleveland, Theodore Roosevelt, Booker T. Washington, Helen Keller, as well as literary notables such as Kate Chopin, Edith Wharton, Jack London and Emily Dickinson. Those are the issues that we, the collectors, hunt for today. The Russell Guide lists the November 30, 1899, March 14, 1900, May 23, 1901, and the May 29, 1902 issues as containing work by Jack London. A list of Emily Dickinson’s appearances are detailed on the excellent Emily Dickinson and The Youths Companion site (which has since disappeared), which is also a great historical resource of information about The Youths Companion in general. The Dickinson issues are as follows: December 24, 1891; August 25, 1892; September 8, 1892*; September 22, 1892; September 29, 1892; May 18, 1893; November 11, 1897; and January 20, 1898. Why the asterisk (*) after the September 8, 1892 issue? Besides containing Dickinson’s poem “Autumn” this is one of the, if not the, most sought-after issue of The Youths Companion because it contains the publication of what would soon come to be known as “The Pledge of Allegiance”. Again, in the case of the Pledge, we have access to another excellent site which reprints the text of several chapters of a Dr. John W. Baer’s 1992 book “The Pledge of Allegiance, A Centennial History, 1892 – 1992.” I read Chapter Two: The Youth’s Companion Pledge and learned quite a bit, which I’ll summarize here with a little help from Dr. Baer. “Between 1888 and 1892 he successfully introduced the Flag into the school and the classroom. In 1891 and 1892 he arranged for the Nation Public Schools Celebration for Columbus to be built around the public schools and a flag ceremony with the as yet unwritten flag salute. In 1892 he described to Francis Bellamy what kind of Pledge he wanted and supervised his writing of it. There is some controversy over the official author of the Pledge of Allegiance, as The Youth’s Companion did not publish bylines in its editorial pages, but from what I can make of Baer’s detailed work, James Bailey Upham conceived the Pledge and Francis Bellamy penned it. After the death of Daniel Sharp Ford in 1899, his company changed its name from the Perry Mason Company to Perry Mason and Company. An interesting aside, Baer mentions that this company name is likely where Erle Stanley Gardner borrowed the name of his more famous hero. The reasons behind Ford calling his company this are unknown, other than his seeking anonymity from his magazine. The decline of The Youths Companion began in 1915 when the company bought a new building to be used as its base of operations. The purchase put them into a debt that they never escaped which combined with declining advertising revenues, and a general decline in circulation after the first World War led to The Youths Companion sale to The Atlantic Monthly Company in 1925. In 1927 The Youth’s Companion shifted from weekly to monthly publication and by 1928 circulation had dropped to only 250,000. In August 1929 the owners sold it to its biggest rival, American Boy, which absorbed the Companion. American Boy had been founded in 1899 as an alternative to The Youths Companion. It was sold in 1939 and published its last issue dated July 1941. Baer, John. 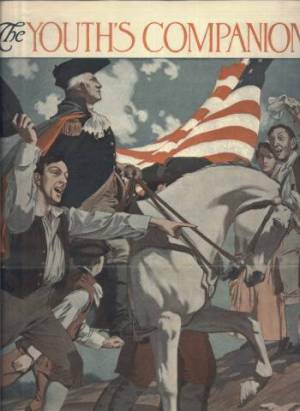 The Pledge of Allegiance: A Centennial History, 1892-1992 . Annapolis, Md. Free State Press, Inc., 1992. Tebbel, John and Mary Ellen Zuckerman. The Magazine in America, 1741-1990 1741-1990. New York: Oxford University Press, 1991.